WorldLoop’s partner Benelux Afro Centre (BAC) and Gillès Foundation have been walking together since September 2014 to bring sustainable e-waste solutions to Kinshasa and the surrounding regions in Democratic Republic of the Congo. This partnership was build around a common objective: to support a social enterprise in DRC that would reduce the problem of e-waste through the encouragement of sustainable use of ICT for Congolese youth, while supporting local recycling activities. To achieve this, a facility has been set up to oversee collecting, dismantling and pre-processing ICT e-waste, while supporting the local and national government in the development of a legal framework for e-waste. BAC has identified collection targets that will be achieved by a holistic approach of setting up a network of collectors, including players in the informal sector who today play an important role in the collection of e-waste and valuable fractions. Today the informal sector is extremely skilled on collection strategies, however lacking skills and equipment to dismantle e-waste in a safe and environmentally friendly way. Thus by engaging with this sector, knowledge transfer begins to happen. The project is also now actively participating Best-of-2-Worlds model (promoting local collection and manual dismantling following health and safety protocols, and shipping the complex and hazardous fractions back to Europe for final treatment). In October 2015, the first shipment of broken, non-function mobile phones departed the port of Matadi, RDC towards Umicore, WorldLoop’s partner in Belgium. Future shipments of complex and hazardous fractions are planned for 2016. 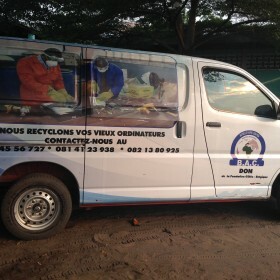 Sustainable e-waste solutions in DRC cannot be achieved without awareness and sensitisation campaigns: BAC worked hard on this and was invited as a key guest of a environmental protection documentary (part 1, part 2, part 3), ran short radio messages to sensitise the population and increase collections volumes and purchased a promotional mini van, that is driven around Kinshasa. WorldLoop’s colleague Aurély had the chance to see the van during her visit to BAC last July. BAC also has a motorbike to collect small e-waste, such as mobile phones. In the coming months, an ICT exchange programme will be launch with schools, to exchange broken ICT assets with refurbished ICT assets. With a win-win approach, schools will be the centralised collection point for e-waste, accessible for the surrounding communities, while having the opportunity of a better access to ICT.